Voted very strongly against prioritising religious freedom. 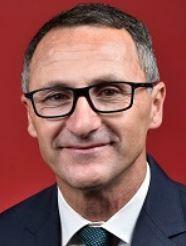 Clearly, he is secular but really hasn’t said much on secular issues given his position as leader of The Greens. It comes after Greens leader Richard Di Natale called on the charities watchdog to revisit its decision not to withdraw the Catholic Education Commission of Victoria’s charitable status for urging Catholic school parents not to vote for his party at the federal election. “Richard Di Natale leads a party that’s prepared to dump on a whole raft of issues on Christian and Catholic Churches,” Mr Elder said. The Greens have called for the dropping of the Lord’s Prayer from the opening of each day’s sitting of Federal Parliament. The party’s acting leader Richard Di Natale says the use of the prayer is outmoded and does not reflect modern multi-faith Australian society.